Michael D. Hults graduated in 1969 with a B.A. in Economics from the University of Michigan. Subsequently, he attended Wayne State University Law School, graduating in 1973. He opened his office in Big Rapids in February of 1974 and has practiced in Big Rapids continuously since that time. Mr. Hults has had a wide ranging, broad legal practice. He currently concentrates his practice in estate planning, wills and trusts, probate estates, real estate, business law, and selected family law matters. Commonly these areas of law overlap and interrelate for many clients. 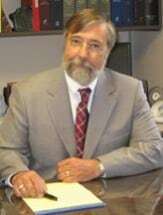 Mr. Hults has 39 years of trial experience, as well as active representation of real estate and business clients before many city, township, county and regional regulatory bodies, zoning boards and planning commissions. In his estate planning practice, Mr. Hults has prepared estate plans for substantial family estates, administered trust assets and processed (and litigated) many probate estates. Asset protection planning is often a primary concern for clients and their families. These concerns require careful consideration and the selection of a course of action taking into account asset preservation, tax consequences, special family concerns, and the protection of loved ones.